Terrorist attack in Ouagadougou (file photo). "The country has never experienced what it is going through now"
It is part of one of the most important nature reserves in West Africa, home to endangered lions, cheetahs, and elephants, attracting tourists from around the world. But in the forests of eastern Burkina Faso - a landlocked former French colony of roughly 17 million people - a new type of visitor can now be found: Islamist militants. The militants, whose affiliation remains unclear, are gaining ground by tapping into long-standing social grievances linked to poverty, poor social services, and the conservation of protected parks, local analysts and officials say. Since early last year, they have launched a string of deadly attacks on government officials, soldiers, and residents, turning the sparsely populated eastern region into the latest front of Burkina Faso's three-year struggle against violent extremists. These attacks mark a significant geographical shift for militants operating in Burkina Faso, who were until recently limited to the country's arid north, close to the border with Mali. This has left states that border the eastern region - Togo, Benin and Ghana, all on West Africa's coastline - fearing they might be the next targets of a similar militant insurgency. With two battlefronts now open, the number of violent attacks in Burkina Faso is rising fast. Earlier this month ethnic clashes triggered by militant incursions in the north left at least 46 dead, while an ambush on government forces in late December killed 10 gendarmerie and injured three others, according to Burkina Faso's security ministry. Last week, authorities extended the state of emergency imposed after the attack for another six months. In just 12 months, the number of people fleeing their homes - mostly in the north - has risen from 9,000 to more than 50,000. As medical workers abandon their posts, around 100,000 people have been left without access to healthcare facilities, while 96,000 children lack formal education following threats and attacks on schools. In 2019 the UN's emergency aid coordination body, OCHA, estimates that 1.2 million people will be in need of emergency assistance. "The country has never experienced what it is going through now," said Metsi Makhetha, the top UN official in Burkina Faso. Much of the eastern area falls within the W-Arly-Pendjari (WAP) ecological complex, a series of protected parks spanning Burkina Faso, Benin, and Niger, parts of which are listed by international agencies and conventions including UNESCO and Ramsar. "They offer people dignity, economic opportunity, and land. They offer them back what the state has taken." The protection of these spaces has led to conflicts over public access to land and mining sites, while new boundaries for pastoral zones for grazing animals has resulted in some residents being forcibly evicted from their villages. These are the kinds of grievances the militants have been quick to seize upon. "They offer people dignity, economic opportunity, and land," said independent Burkinabe researcher Mahamoudou Savadogo. "They offer them back what the state has taken." Mining sites, hunting concessions, tourism, and cotton production contribute substantial amounts to the national economy, but locals rarely benefit, Savadogo said. "It is a rich region, but people are very poor." The militants also feed into wider national and regional dynamics. Burkina Faso is among a number of countries in the Sahel, including Mali and Niger, that are witnessing an alarming increase in violent extremism that is destabilising the region. In Burkina Faso, the extremists have found a country with a security apparatus weakened by the fall of Blaise Compaoré, who ruled the country for 27 years before a popular revolution sent him packing in 2014. It has been weakened further by the dissolution of Compaoré's elite army unit, the Regiment of Presidential Security, or RSP. 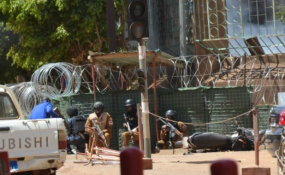 Hundreds of attacks have since been recorded, including major assaults on the capital, Ouagadougou, while a homegrown Burkinabe Islamist group known as Ansaroul Islam - which has close links to militants in Mali - has emerged in the country's northern Soum province. Ansaroul Islam are now among the groups thought to be involved in the violence in the east, as are Islamic State in the Greater Sahara (ISGS), armed bandits, and young local men radicalised while studying at Islamic schools in Mali. In hushed voices some government officials even suspect the long arm of Compaoré and his dissolved, disgruntled RSP troops. "All analyses are plausible," said Ousmane Traoré, the governor of the eastern region. Ousmane Traoré, the governor of Burkina Faso's eastern region, where locals say they feel left out of new economic initiatives. While the militants have found common interests with some local residents in the east, the cost has been high for many others. In recent months dozens of troops have died in roadside bombs and ambushes, while a growing number of civilians are also being targeted. "They take root, then they show their true colours," said a local official from one of the east's most conflict-affected towns, who like many people interviewed by IRIN did not want to be named for fear of reprisals. School teachers, in particular, are in the firing line. Just 150 kilometres to the east of Fada N'gourma, in the commune of Kantchari, schools are closed and students are idle. In late November, militants forced the administrator of the largest primary school in town to round up the French language textbooks and set them on fire. A classroom and office burnt down in the blaze; the nearby schools closed down in fear. "Every day I am afraid of what might happen to my parents." Only a fortunate few students have been able to relocate to safer areas like Fada N'gourma. But even in safety, life is challenging. A rail-thin 15-year-old girl with a deep cough said she is living alone in Fada N'gourma with her younger sister - only the generosity of her teachers ensuring she is properly fed. She was recently moved down a school year because there was no space left in her own age group and spends her days paralysed by fear of what is going on back in her village. "Every day I am afraid of what might happen to my parents," said the girl. A growing number of civilians are being targeted by militants on roads out of Fada N'gourma. As state officials flee the east, the government's already limited capacity to help those in need is dwindling. In September, a landslide at a militant-controlled gold mine in the eastern town of Kabonga left between 50 to 100 people dead. Nobody knows the precise number because the state was unable to launch a rescue mission. A 35-year-old farmer on his first ever trip to the mine "had hoped to be blessed by God and find gold", according to his younger cousin. Instead, he was buried alive - "immediately and brutally" - leaving behind a young wife and two small children with little means of support. "It is heartbreaking," the cousin said. While the humanitarian toll of the violence in the east remains relatively low level, signs of what might come can be found in the Soum province of northern Burkina Faso, where clashes between militants and the army have caused tens of thousands of civilians to flee their homes in the past few months. It is here that Ansaroul Islam first set up base in late 2016 using a similar strategy of tapping into social grievances, and it is here where they continue to gain strength despite recent military operations against them. A 59-year-old farmer from Belede, a small village in Soum, said Ansaroul Islam militants spent two years harassing his neighbours for money and information on the whereabouts of local authority figures. When the villagers finally stopped cooperating, the militants grew angry. One day, three months ago, they rounded up locals at the market and told them to leave. "They said: 'if we come back and find you here, you won't escape'," the farmer recalled from a flyblown cafe in Kongoussi, 90 kilometres south of Soum. "When somebody tells you this, you do what they say." Among the displaced are many who have fled abuses by the Burkinabe armed forces. They have engaged in killings and arbitrary detention during counterterrorism operations, according to Human Rights Watch. Most at risk are members of Soum's majority Fulani ethnic group, who are targeted for recruitment by the militants and are stigmatised by security forces. One Fulani teacher who shares his surname - Dicko - with the founder of Ansaroul Islam, said four members of his family (all Dickos) were loaded onto the back of a military pickup truck near the village of Damba roughly a year ago, driven into the bush, and executed. "If you are a Fulani and a Dicko you are in trouble," said the teacher. For months, humanitarians said the displaced in Soum did not want to register for aid because they were so afraid the militants would accuse them of speaking with "outsiders". But as healthcare centres and schools closed and agricultural activities became harder to perform, many are left with few options. Teachers are in the firing line, and 96,000 children are out of school because of ongoing militant attacks. The farmer from Belede said 18 members of his family now share a small rented house in Djibo, the provincial capital of Soum, one mattress and one mosquito net between them. As his savings dwindle, evening meals have become increasingly rare. "We need to act," said Makhetha, the UN official, "and act urgently". In the east, as in the north, the government's response has been to launch military operations. They have been supported by French troops from a 3,000-strong counterterrorism force in the Sahel called Operation Barkhane, on its first mission in Burkina Faso. But analysts say military force is unlikely to address the local grievances militants in the east are tapping into. Instead, they fear it will create a cycle of killings, distrust, and displacement - a cycle some feel has already begun. In December, a young homeless boy was found strangled to death outside the house of a local preacher in Namoungou, a village close to Fada N'gourma. Many say he was killed by militants after startling them with the light of a torch during an early morning operation. Others say he was killed by the army who mistook him for a militant. Whatever the truth, one local teacher said the sound of an approaching motorbike - the militants' preferred mode of transport - is now enough to make the few students still in class freeze in terror. "Shocked," said the teacher. "Everybody here is shocked."